iPhone 5C comes with a plastic back in a multiple choices of colors but has a steel frame under the polycarbonate making this new handset "beautifully, unapologetically plastic." 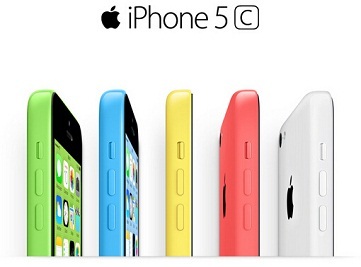 iPhone 5C features Apple's decent A6 chip, retaining 4-inch Retina display and better front-facing FaceTime HD camera. The new iPhone is great device for watching video equipped with a 1136x640-pixel resolution that makes for a pixel density of 326ppi. Can I play FLV on iPhone 5C? However, if you're trying to figure out how to watch high quality Flash Video (FLV or F4V) animated on online streaming sites including YouTube, Hulu, VEVO, Yahoo! Video, metacafe, Reuters.com etc., this article rolls out an effective FLV converter solution to seamlessly stream FLV to iPhone 5C with high quality. 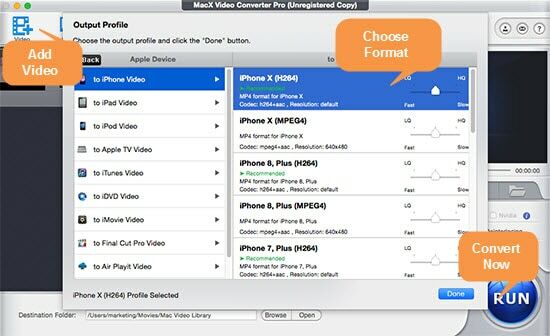 MacX Video Converter Pro achieves the top ranking in iPhone video converters with built-in category-attracted UI. It is specially designed for iPhone users (iPhone 6S/6/5S, iPhone 5C included) to convert FLV to MPEG-4/H.264/MOV on Mac OS X (Yosemite/El Capitan) for playing FLV file on iPhone 5C/5S in world's fastest speed and perfect output quality. No.1 FLV video converter for iPhone 5C to convert FLV videos to iPhone 6S/6S Plus/6/6 Plus/5s/5c etc with excellent quality and world's fastest speed (5X faster). Moreover, you can also download YouTube videos with the help of desktop software MacX Video Converter Pro without jailbreak. This iPhone video converter features built-in YouTube downloader which can help users download YouTube videos, then convert and transfer them to iPhone, iPad, iPod with one click. Free download FLV converter then run it, click "Add File" button to import FLV video. Or you can also drag your FLV file directly to the main interface. If need download Windows version, if you are a Windows user. When the FLV import is completed, the output profile pane will automatically pop up and help you quickly steer towards iPhone 5C under Apple Device category. Click Run button to start the video conversion. After conversion finished, activate iTunes, and then you can add FLV to iPhone 4C for enjoyment freely. Tips: MacX Video Converter Pro works as an all-in-one solution not only to convert your existing FLV video to iPhone 5C, but also is capable of downloading YouTube videos, making photo slideshows, recording Mac’s screen, editing video. This free FLV video converter Mac is designed for Mac users to convert FLV video to popular used formats and convert video to FLV for web sharing. Deeply troubled the plenty of iPhone 6 video converter software but no one works properly for you? Find the best software in the guide to convert FLV, AVI, WMV, MKV, etc to iPhone 6 and iPhone 6 Plus readable format easily.